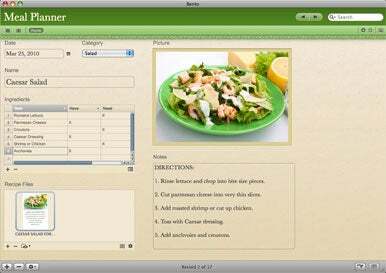 FileMaker has announced the release of a new package of free templates for its consumer-oriented relational database application Bento 3 aimed at organizing a family’s every activity from chores to meal planning. Called Bento 3 Family Organizer, the new offer also includes a 30-day free trial of Bento, after which families who want to continue using the templates will have to purchase a full version of the database software, which retails for $49. Each of the templates in the package covers a specific family activity. For example, you could organize your shopping, set up and track all your bill payments and even assign chores to each member of your family—which is sure to make the product a winner with the teenage kids in every house. Bento 3 requires Mac OS X 10.5.7 or 10.6 and higher; the templates that come with the Family Organizer package are also compatible with the iPad and iPhone versions of the software.